In December 2008 Pro-Palestinian protesters at a rally in Fort Lauderdale, Fla., took their anti-Israel rhetoric a step further, calling for the extermination of Israel — and of Jews. Nazi Palestinian woman in the movie calls for Jews to ‘Go Back to the Oven’ at Anti-Israel Demonstration. The organizer of this protest and several other anti-Israel protests in the Miami area was Mohammad Malik. Today, Malik is heading the local Occupy Miami movement. The recent executive director of the controversial Council on American-Islamic Relations’ South Florida chapter is a founder and spokesman of Occupy Miami, WND has learned. Mohammad Malik currently is as an activist with several other Islamic groups. He has led hate-filled anti-Israel protests in which participants were filmed wearing Hamas paraphernalia while chanting “Nuke Israel” and “Go back to the oven” – a reference to Jews being killed in the Holocaust. Malik has been widely quoted in the Florida news media in recent weeks speaking for Occupy Miami. … Malik himself was the principal organizer of numerous anti-Israel rallies. 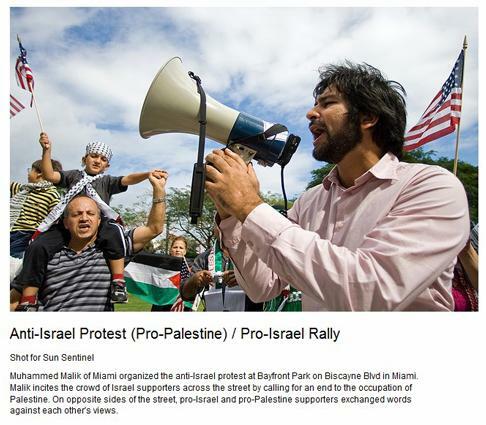 Mohammad Malik led anti-Israel protests in Miami in March. Now Muhammad Malik is leading the local Obama-endorsed #Occupy Miami protests.